I’m getting ready for the National Yo-Yo Contest in one week. I’ll be entering in the One Handed and Freehand divisions this year, same as last. Phil (from Yes, Absolutely.) and I where hoping to have some shmooved up Bolt yo-yos for sale, but right after picking up the yo-yos from my pad, Phil was hit by a semi-truck. Don’t worry, I know that sounds terrible, but luckily the only damage Phil had was to his right foot. Icky image below. 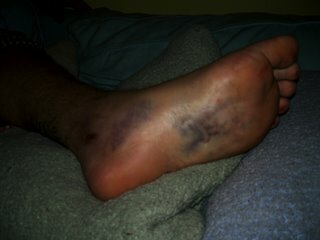 So Phil is off his foot for a week or two. I’ll have modded and stock Bolts, comic books, and medium shirts with me for sale or trade at the event. Next post: In case you missed it. Hope you had fun at Nationals!